May we be even happier in 2015 compared to 2014 and previous years. 1. 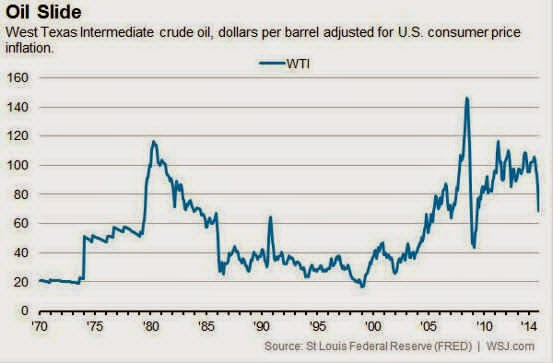 Economics 1, Cheap oil. Thank you competitive capitalism for reasserting yourself. 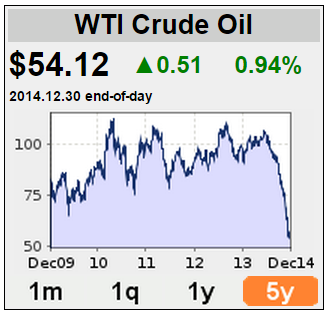 OPEC cartelization and cronyism is boink, shale oil and gas capitalism is cool. We have entered a world of rising abundance. The on-going cheap world oil further affirms that. That's for the last five years. Here is the chart for the last 45 years. Inequality is good and natural, and Piketty and the UN, WB, IMF, ADB, governments, socialists are wrong to complain about rising inequality. If my statement is wrong, then I demand that my income should be at least 1/10 that of Mark Zuckerberg or Bill Gates, even if I work only two hours a day and drink and party 10 hours a day. 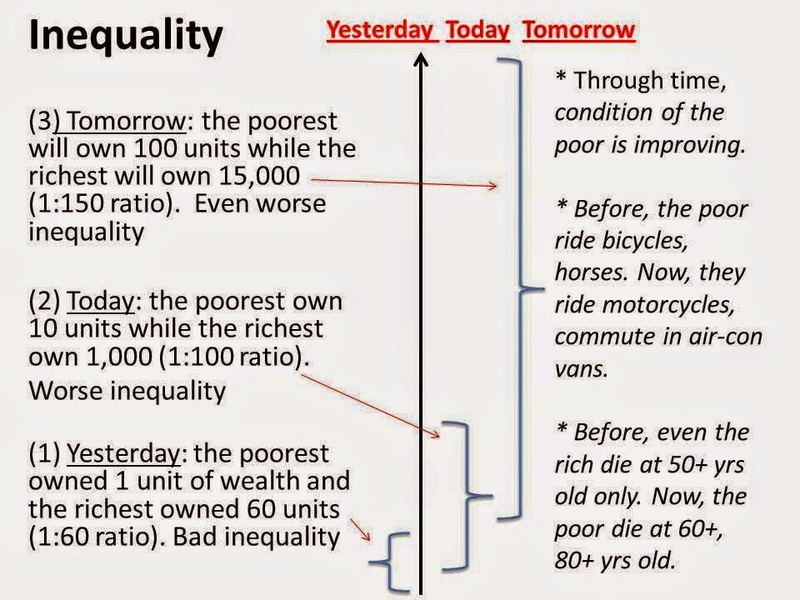 Today's poor are better off compared to the super-rich 100 or 50 years ago. This is from The Economist magazine, November 20th 2014 issue. Fiscal crisis by many fiscally irresponsible governments (FIGs) in Europe and elsewhere in 2014, all they do is spend-tax-borrow-borrow more. 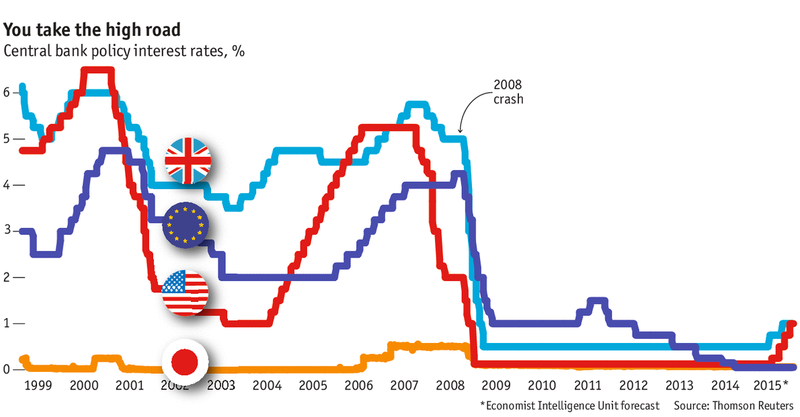 If supply of credit does not keep up with demand forl credit and debts, interest rates should go up. This did not happen. Which means capitalism worldwide is adjusting and getting more efficient, producing more surplus that it can continue to bailout those FIGs with low interest rates even if they continue with their endless borrowings policy. To hell with you communism, hehehe. China communism and dictatorship is lousy; to extend that dictatorship to a former British colony that championed free trade, yes, unilateral free trade, is lousy too. But as I argued repeatedly, freedom of expression should not curtail freedom of mobility of other people. Thus, I did not support prolonged occupation of HK's streets and thus, I support the clearing of those unoccupied tents that block major roads. Lots of violence and intolerance. Their big problem is that people, including their fellow Muslims in many countries, are getting more intolerant with intolerance and violence. Thus, while they gained prominence at the start, they later gained notoriety and condemnation later. Booo, Vladimir Putin. Military invasion and occupation is too taboo these days. Only dictators and insecure leaders would do that. Now #1 above, cheap oil, is piercing huge holes on your dictatorial leadership. 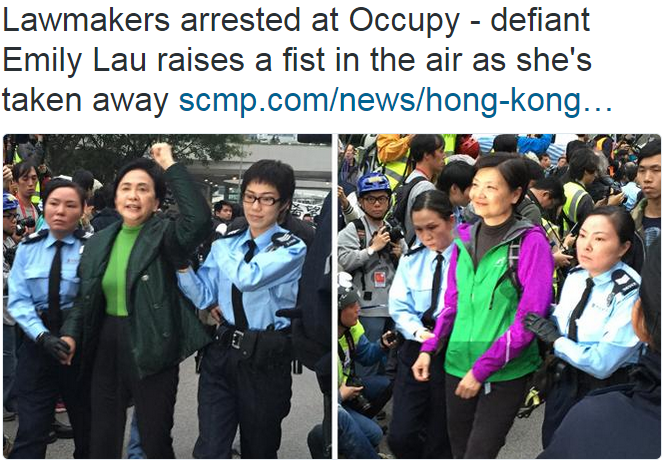 Fellow dictatorship in China is now bailing you out. 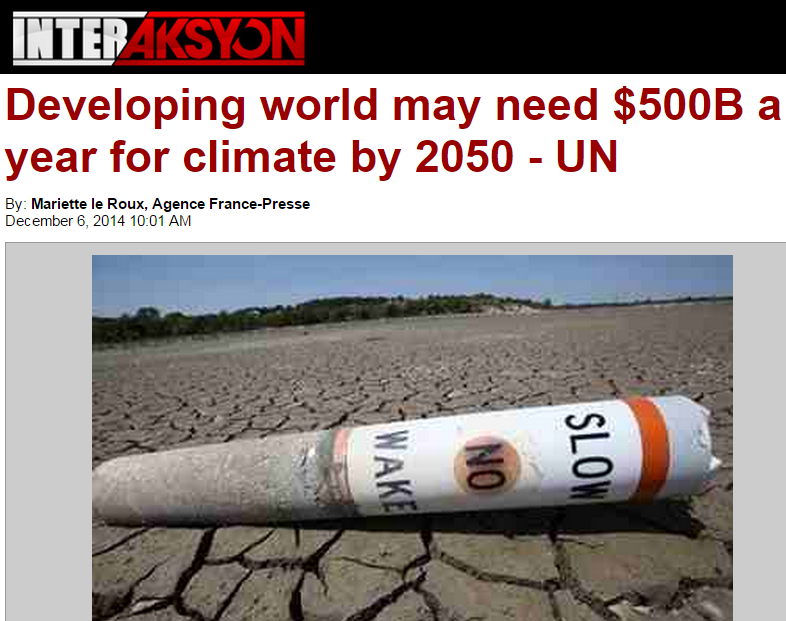 $500 B a year of climate money from rich countries to developing countries? wow. Actually some extortionists are joking. While they demanded $100 B a year in 2009, revised the estimates to $500 B a year, the UN climate spokesperson suggested $6 trillion a year. Wow. 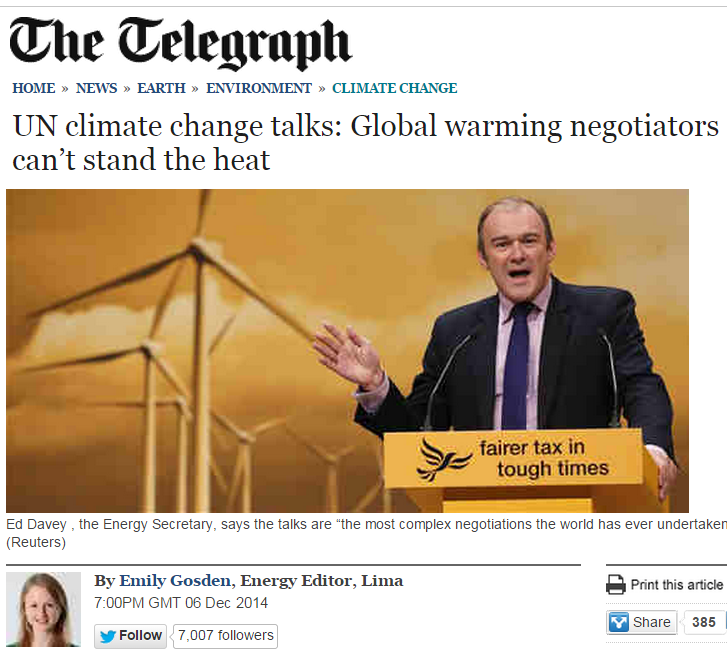 Money money money, always sunny, in the climate alarmism and extortion world. 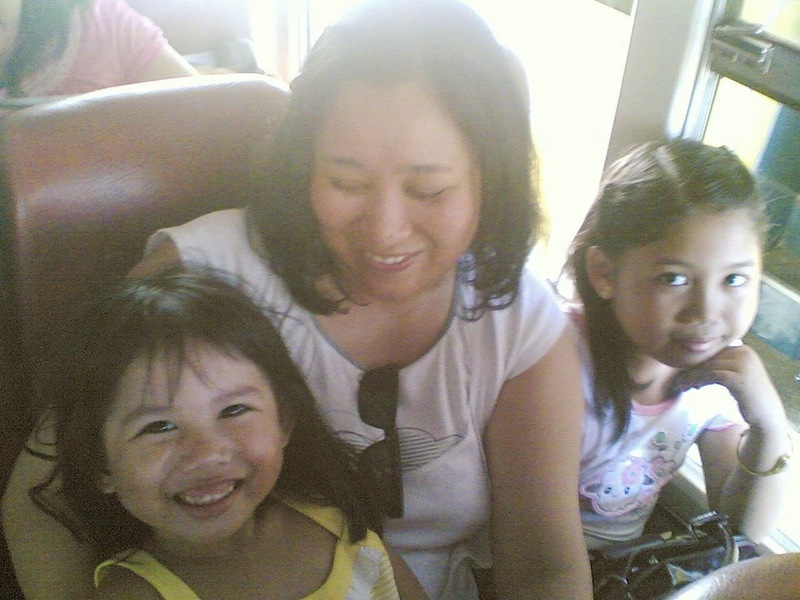 One of the many faces of MERS-CoV victims in the Middle East, my sister in law, Gemma B. Oplas, In this photo, she was holding my elder daughter while they were in Bacolod City in 2010, her lone kid Lois looking on. An ER nurse in a Saudi government hospital in Riyadh, she was taking care of a MERS patient who ironically survived, she was infected, she did not survive. MERS-CoV, Ebola, dengue, HIV, H1N1 and other infectious diseases, are living and evolving microorganisms, They will keep evolving and spreading themselves. There is nothing we can do about them except have proper isolation system of victims, and have evolving treatment to evolving diseases. More science, more innovator medicines, less politics. Horrible loss for Brazil, the host of 2014 soccer World Cup. After barreling its way to the championships, it lost to Germany 1-7, agghh! But the common global excitement of Europe vs S. America in the Finals or semi-finals has been affirmed. I wish to see an Asian team in the finals someday. 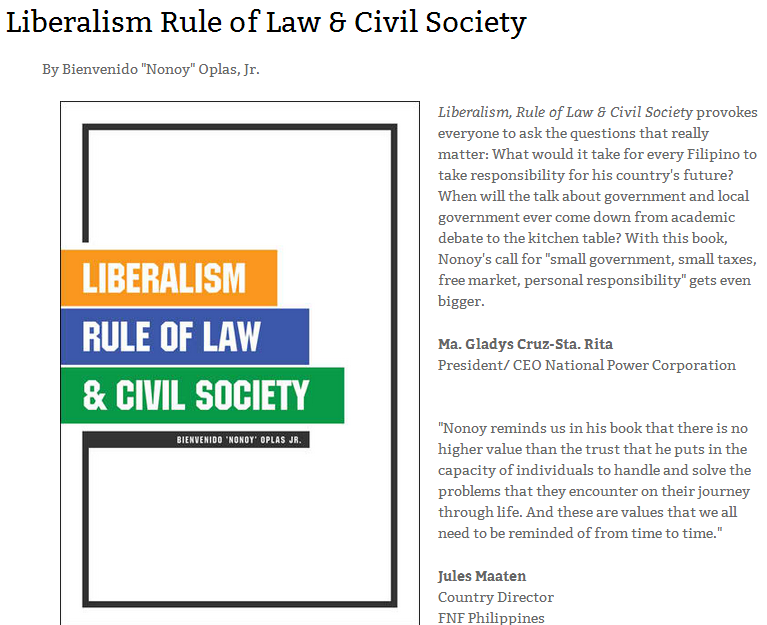 Published by FNF PH office, this book reaffirms the beauty of classical liberalism, rule of law (not rule of men) and more civil society (and less government, less coercion). 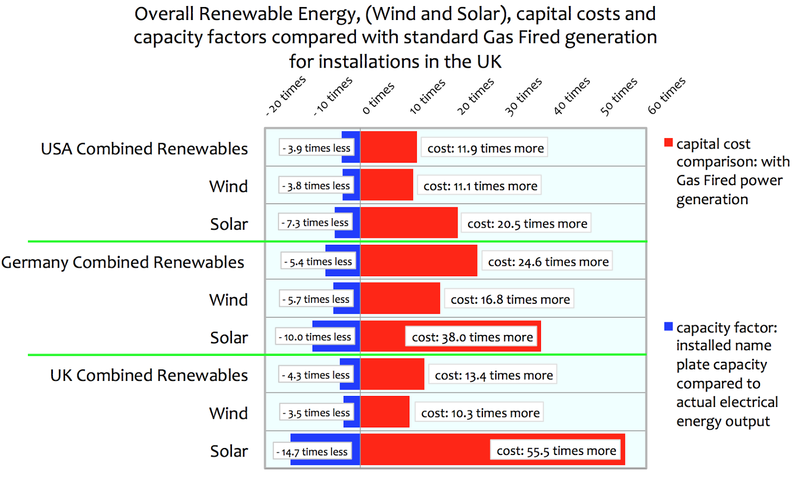 Another compilation of news reports and charts here, about the costly and unreliable electricity from renewables despite all the subsidies. (1) From Spiegel International, September 4, 2013. 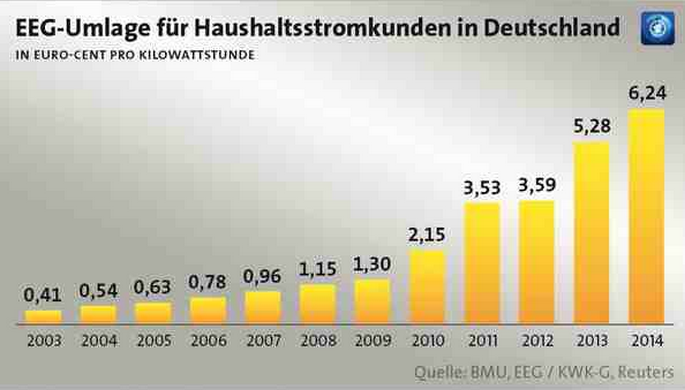 German consumers already pay the highest electricity prices in Europe. But because the government is failing to get the costs of its new energypolicy under control, rising prices are already on the horizon. Electricity is becoming a luxury good in Germany, and one of the country's most important future-oriented projects is acutely at risk. "On Thursday, a government-sanctioned commission plans to submit a special report called "Competition in Times of the Energy Transition." The report is sharply critical, arguing that Germany's current system actually rewards the most inefficient plants, doesn't contribute to protecting the climate, jeopardizes the energy supply and puts the poor at a disadvantage. Energy intensive industries in particular have lost confidence in the future of Germany as a business location," said Thomas Mayer, a former chief economist at Deutsche Bank who now runs the Cologne-based Flossbach von Storch Research Institute. 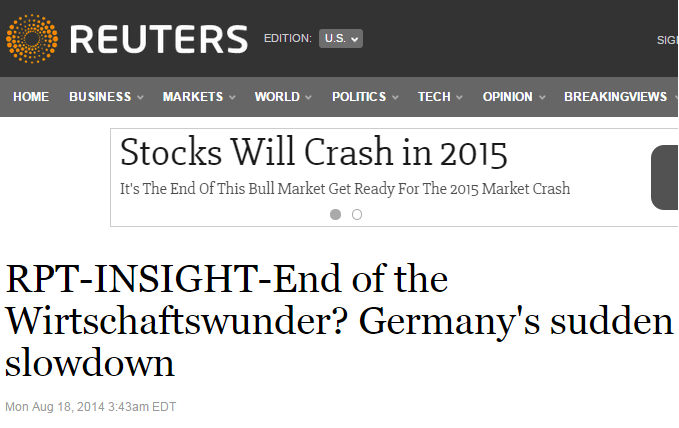 "I think this is a major issue that will burden German industry for years to come. 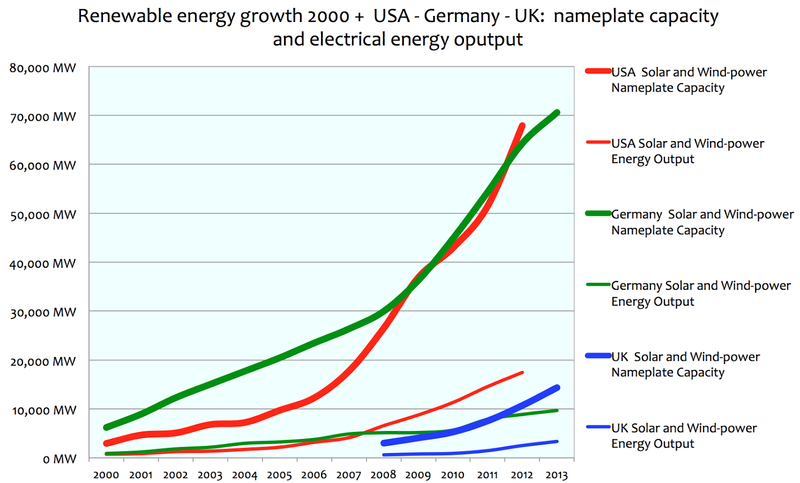 Good chart, Renewables' rated capacity vs. actual energy output, cases of the US, UK and Germany, 2008 to 2013. Huge gap between the promise (rated cap) and reality. 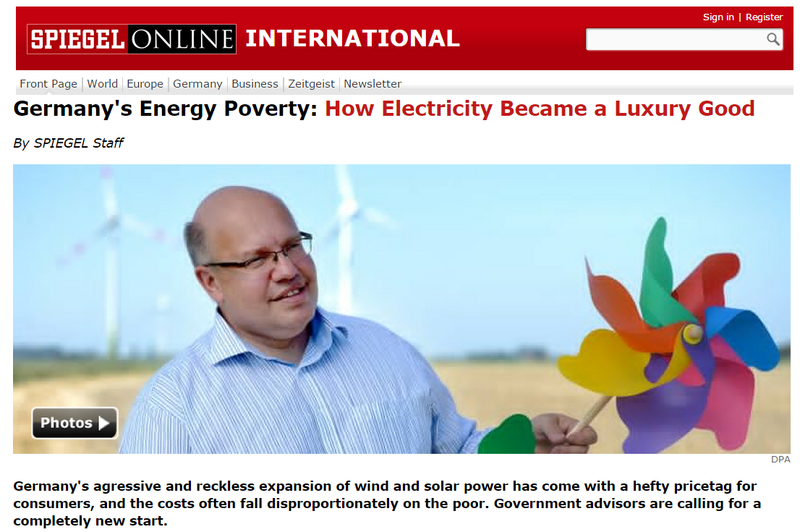 The inefficiency of intermittent sources like wind and solar in Germany can be offset by the efficiency of nuke in France and coal in Poland, thus Germany won't have brown outs. What the renewable fanatics in Germany (and abroad) forgot is that if they shut down their nuke or coal, then Germany will buy power from France, which is largely nuke power. Or buy from Poland, which has huge coal power. Same banana. See this chart for instance. 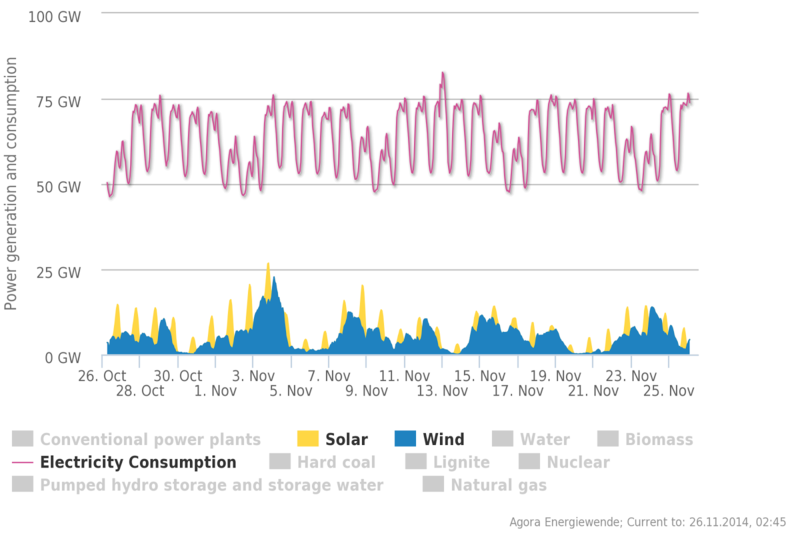 Germany needs up to 75 GW power on certain hours of the day, but solar + wind can supply a max of 25 GW. On other hours, solar + wind power is... zero, the wind doesnt blow, the Sun doesn't shine. Subsidize renewables more. 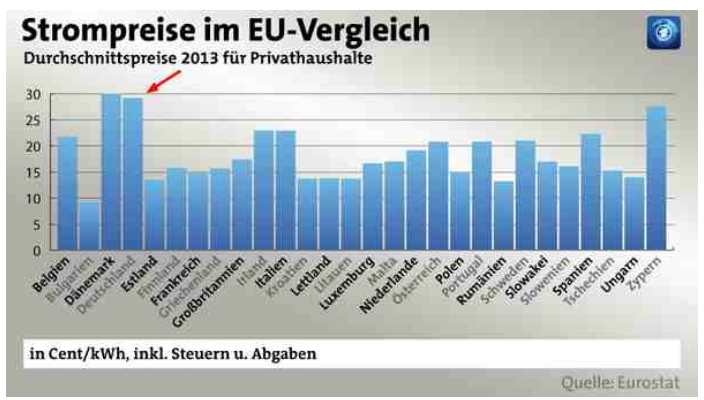 Price of power for all EU countries. cents/kWh, 2013. Denmark has the most expensive, Germany (Deutschland) is second. the silverback of the “big four” German energy producers who group the bulk of the country’s conventional and nuclear power production is about to close shop at short notice. The others will probably follow suit. ...both the minister for economic affairs and the chancellor’s office hastily preparing new legislation aiming at enhancing the situation of coal-fired plants by implementing an all-new market design. It will most certainly provide for compensation payments for coal-fired plants forced to turn idle or at minimum load when the grid is clogged by an oversupply of wind and solar energy. With 23 billion euros annually, the government subsidizes renewable energy that is worth only 2 billion on the market. 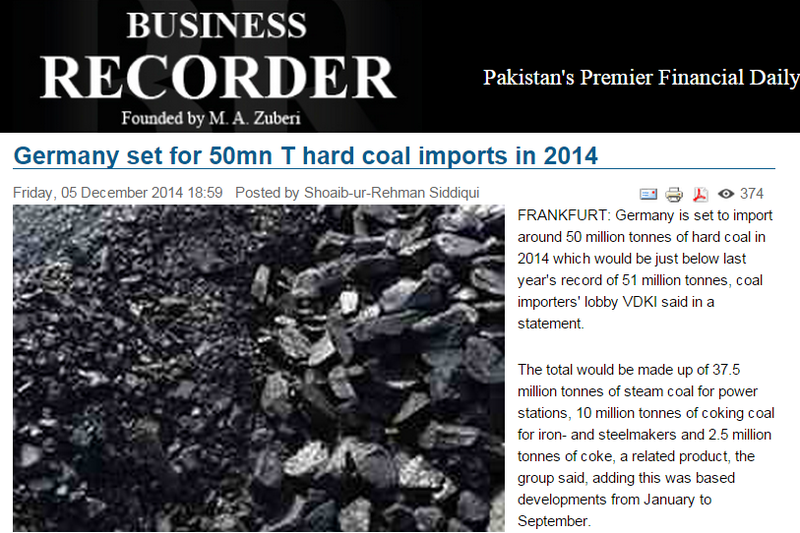 (8) From Business Recorder December 5, 2014. 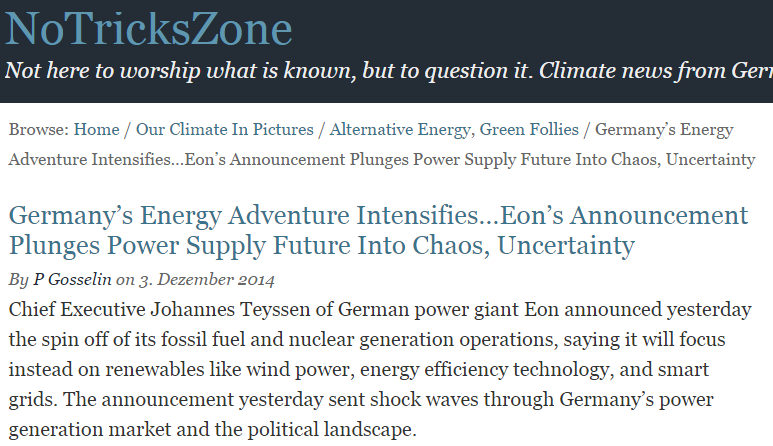 Coal, not wind or solar, is Germany's electricity backbone. Coal generation is still the backbone of German power supply in a country set on moving away from nuclear power and favouring renewable energy over fossil fuels. The country in January to September used hard coal for 43 percent of coal generation, of which 17 percent was hard coal and 26 percent domestic brown coal, industry statistics showed. It’s a blunder with ugly consequences. 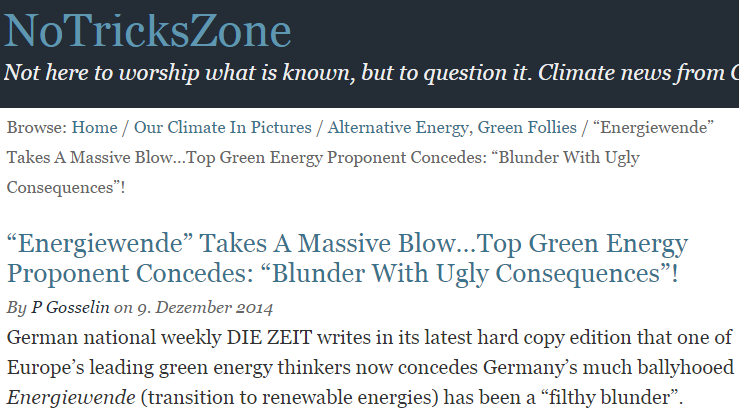 The Energiewende, as it is now set up, is not making the air cleaner, but dirtier. Dozens of protest groups have sprung up over the past year along the 500-mile path of the project, SuedLink, one of four high-voltage direct current lines that are to carry wind-generated power from north to south. The lines are described as essential to the success of the country’s pivot away from nuclear and coal power and toward mostly renewable energy. But nearly a year into the plans, the SuedLink project has set off an outbreak of not-in-my-backyard syndrome that threatens to disrupt a linchpin of Germany’s commitment to a lower-carbon future. 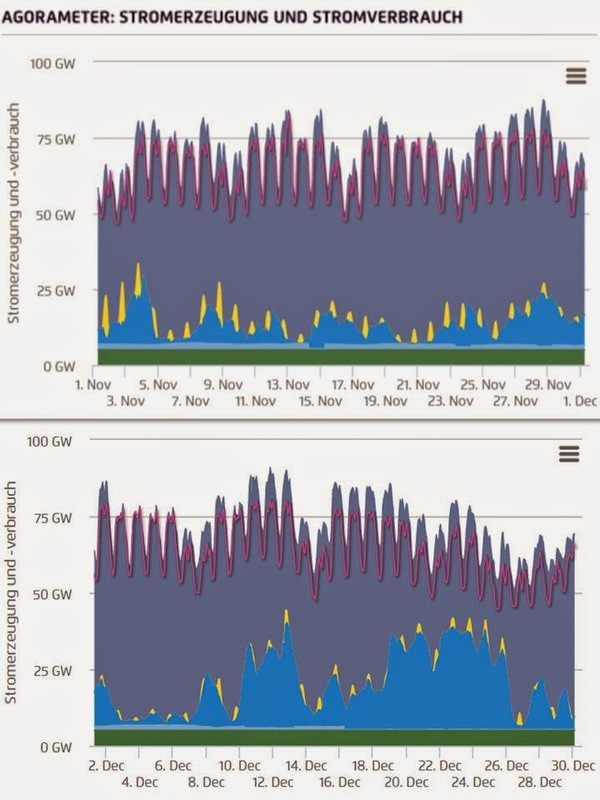 Finally, here is the actual electricity production in Germany from November 1-30, 2014 (above) then December 1-30, 2014 (below). Dark blue is fossil/coal and nuke; medium blue is wind, yellow is solar, green is biomass. When the wind does not blow, when the Sun does not shine, electricity output is zero. It is really the "non-renewables" that give stable and reliable electricity to Germany and all other countries in the planet. Bottomline: Governments should NOT intervene in electricity pricing, should NOT force, coerce and arm-twist all other electricity consumers to buy and subsidize from expensive and unstable power sources. Let consumers buy expensive electricity voluntarily so they can put their money where their mouth is. Those who are not convinced of such policy should not be coerced. The anthropogenic or "man-made" warming/CC camp is generally a parochial and short-time reference hypothesis. I say parochial because they only focus and blame carbon dioxide (CO2) as climate driver and generally don't mention or discuss other natural contributors to climate forcing like the Sun, galactic cosmic rays (GCRs), water vapor, Pacific decadal oscillation (PDO) and Atlantic multidecadal oscillation (AMO), volcanoes, etc, And I say "short-time" reference because they generally look back over the past 160 years only, in the mid 1800s which coincided with the end of the little ice age (LIA) and started a new cycle of past century's warming. There is another good scientific paper posted in WUWT yesterday, Vostok and the 8000 year time lag by Euan Mearns. I am reposting portions of that paper including the concluding notes. The author's data covering nearly 450,000 years showed long-term warming-cooling-warming-cooling cycles. Yes, global warming did happen hundreds of thousand years ago when there was not even bicycles or telephones. Here are portions of Dr. Mearns' paper. In comparing the temperature, CO2 and CH4 signals in the Vostok ice core, it is important to understand that the temperature signal is carried by hydrogen : deuterium isotope abundance in the water that makes the ice whilst the CO2 and CH4 signals are carried by air bubbles trapped in the ice. The air bubbles trapped by ice are always deemed to be younger than the ice owing to the time lag between snow falling and it being compacted to form ice. In Vostok, the time lag between snow falling and ice trapping air varies between 2000 and 6500 years. Note that in all my charts time is passing from right to left with the “present day” to the left. The present day (year zero) is deemed to be 1995, the year that the cores were drilled. The GT4 time scale of Petit et al is used. The methane concentrations in gas bubbles and temperature variations in Vostok are incredibly well aligned, especially at the terminations and return to glaciation when temperature variations are at their greatest. Methane and temperature variations. 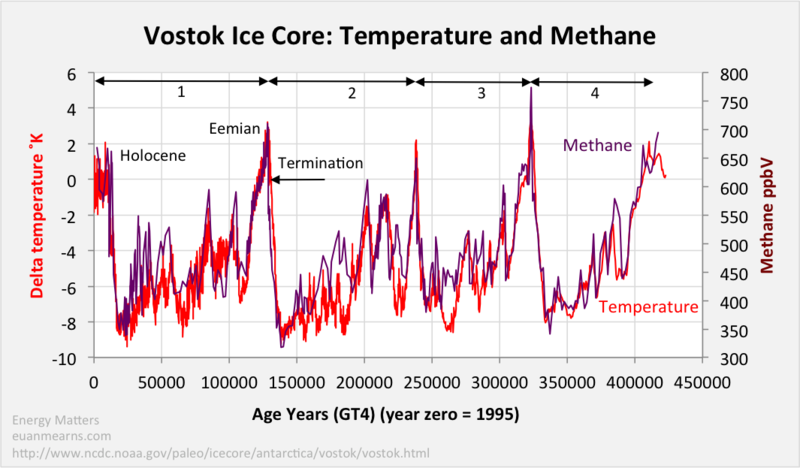 Note how methane and temperature are particularly strongly aligned at the terminations and during subsequent decline back to glacial conditions. This shows that the ice age to gas age calibration is good. But does it show that methane variations of ±200 ppbV (parts per billion) are amplifying the orbital control of glaciations? The fit of CO2 to temperature is actually not nearly so tight as for CH4. There is a persistent tendency for CO2 to lag temperature throughout and this time lag is most pronounced at the onset of each glacial cycle “where CO2 lags temperature by several thousand years”. CO2 and temperature appear well-correlated in a gross sense but there are some significant deviations. At the terminations, the alignment is as good as observed for methane. But upon descent into the following glaciation there is a time lag between CO2 and temperature of several thousand years. Petit et al  make the observation but fail to offer an explanation and to take the significance into account preferring to make instead unsupportable claims about CO2 and CH4 amplifying orbital forcing. CO2 lags methane in a manner similar to the lag between CO2 and temperature. This time lag requires an explanation rooted in the geochemical environments that are both emitting and sequestering these gases. Petit et al  devote surprisingly little space to explaining the physical processes behind the CO2 and methane variations at all. So what may actually be going on? 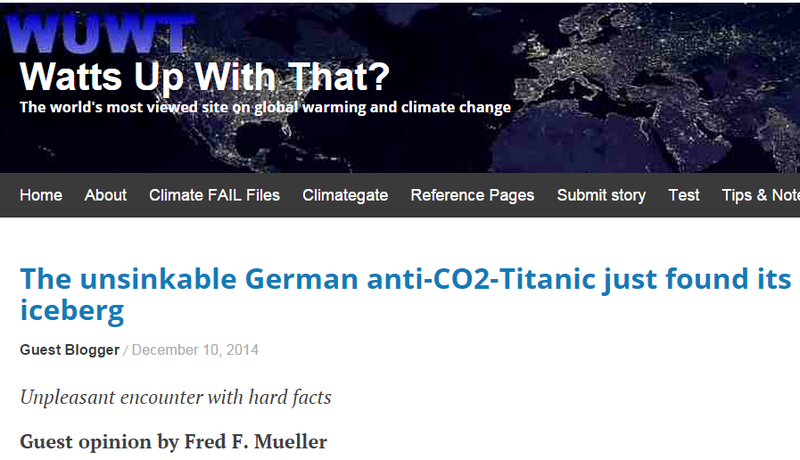 A few months ago Roger and I had a series of posts on Earth’s carbon cycle. We never really got to the bottom of it but in the process learned a lot and turned up much interesting data. I made three interim conclusions 1) deep ocean water contains much more carbon than the surface, and because of this 2) the much publicised oceanic CO2 solubility pump cannot exist and 3) most CO2 is removed from the atmosphere by photosynthesis – trees on land and phytoplankton in the oceans . This may help us to understand the CO2 time lag. The deep oceans contain vast amounts of carbon, the product of rotting plankton at depth, and when the oceans warm or overturn, this C can be released to the atmosphere, quickly. But the return trip is not so simple since this depends on photosynthetic rates. In short, it seems that the oceans can exhale CO2 much more easily than it can be inhaled again. On land, the re-creation of northern hemisphere ice sheets will kill high latitude forests and cause global migration of climatic belt boundaries towards the equator. Killing forests reduces the size of the terrestrial CO2 pump whilst simultaneously adding a source of CO2 – rotting wood. This will tend to offset the oceanic biosphere’s ability to pump CO2 down during the cooling phase. * Over four glacial cycles CO2, CH4 and temperature display cyclical co-variation. This has been used by the climate science community as evidence for amplification of orbital forcing via greenhouse gas feedbacks. 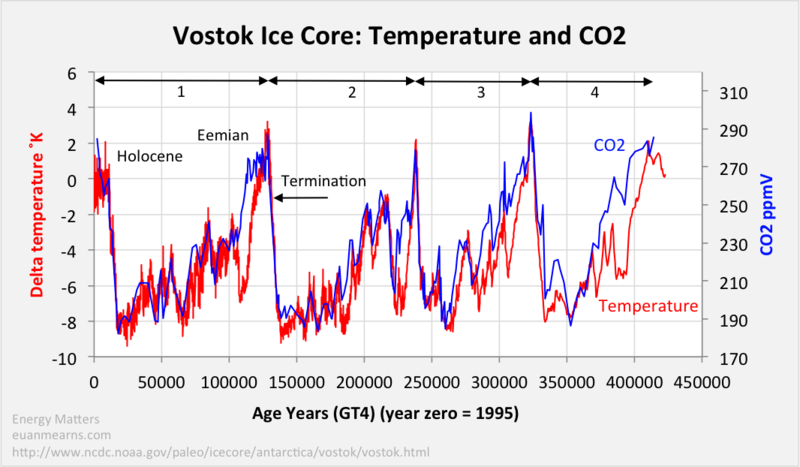 * I am not the first to observe that CO2 lags temperature in Vostok  and indeed Petit et al  make the observation that at the onset of glaciation CO2 lags temperature by several thousand years. But they fail to discuss this and the fairly profound implications it has. * Temperature and CH4 are extremely tightly correlated with no time lags. Thus, while CO2 and CH4 are correlated with temperature in a general sense, in detail their response to global geochemical cycles are different. Again Petit et al. make the observation but fail to discuss it. * At the onset of the last glaciation the time lag was 8,000 years and the world was cast into the depths of an ice age with CO2 variance evidently contributing little to the large fall in temperature. 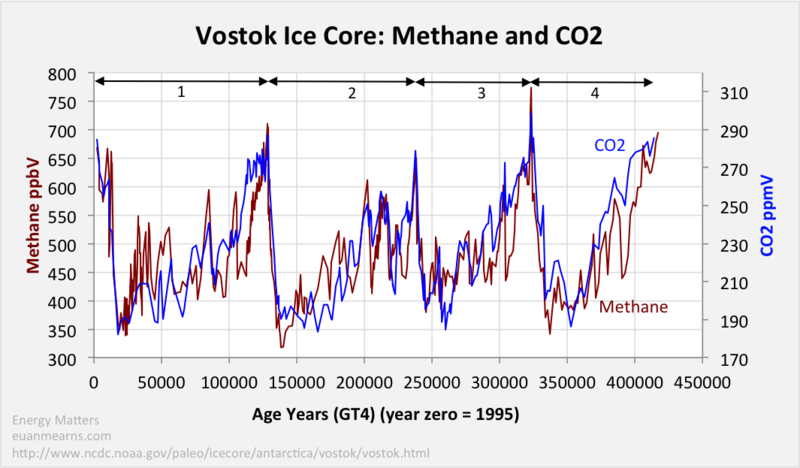 * The only conclusion possible from Vostok is that variations in CO2 and CH4 are both caused by global temperature change and freeze thaw cycles at high latitudes. These natural geochemical cycles makes it inevitable that CO2 and CH4 will correlate with temperature. It is therefore totally invalid to use this relationship as evidence for CO2 forcing of climate, especially since during the onset of glaciations, there is no correlation at all. 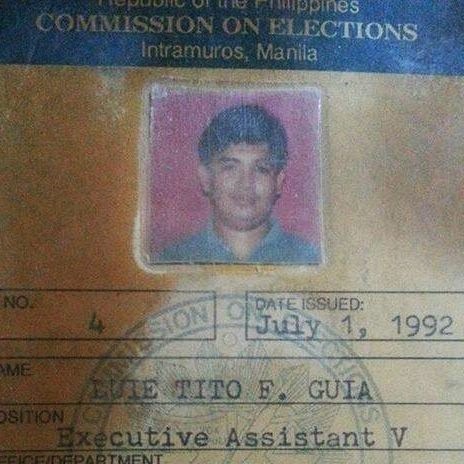 Today, Commission on Elections (Comelec) new Commissioner Luie Guia, a friend from undergrad days in UP Diliman some three decades ago, posted in his fb wall this message below. I am reposting this with his permission. I also added two of his photos posted in his wall. To all my co-workers in Comelec. I am relatively new in the Commission on Elections and I was told that criticisms are part of the job. I have been trying to understand this situation especially as I have been associated with many of those who have recently been attacking Comelec on this single issue of election automation. I am sure that while many of you have mastered the art of ignoring these attacks and live as if they do not exist, some also do get hurt and troubled. It is important to listen and understand the issues that our critics are raising. I always think that listening to the public is part of our job. It is also important, however, for us to realize that, in the end, it is we in the Commission who are tasked to execute the institution’s mandate and are therefore the ones primarily responsible for the success or failure of managing our elections. Thus, for as long we can honestly and confidently say that we are hardworking public servants who conduct ourselves in the highest standard of integrity, competence, and service and who have the best interest of the public in mind, we can proudly hold our heads up high and face anyone with courage and dignity. While we cannot profess to have the monopoly of election knowledge and expertise notwithstanding our years of election management experience, nobody, and simply nobody, can rightfully claim the monopoly of good intentions. Not us. Not our critics. Not anyone else. Needless to say, well-managed elections bring about good governance, which, in turn, translate into better service to the people. After work we all return to our respective communities and experience government service, or the lack of it, like all other citizens of the country do. There is no sense therefore for us to be doing our work with less passion and dedication than necessary as we are our own client. We stand to benefit from the good works that we do. We also stand to suffer if we do not do our job well. We cannot fail to serve ourselves. Let us therefore face these criticisms by showing to everyone how we work hard to improve the process and how we are addressing some of the valid issues. Let’s also show that we are achieving great headways in the other aspects of elections. We are pursuing to give better electoral access to those traditionally deprived of access (PWD, Detainees, IPs, IDPs). There is an unprecedented vigor in enforcing campaign finance laws. We will continue to ensure fairer election by enforcing campaign rules. We are continuing to do organizational development efforts to make our institution more responsive to the demands of the times. Let us highlight our successes as we also continue to correct our failures. Let’s be proud of ourselves and of what we do. A hopeful New Year to All. I decided to repost this because I personally know Luie, he is a sincere and honest guy, and I believe that credibility, credibility, and credibility of an electoral exercise is the single most important service that a government election administration body can give to the public. I sincerely hope that we are going towards more credible elections through time. Not that I believe that politicians and legislators can give us heaven on earth, far from it. Rather, since existing rules say that we need to have a President and Vice President, Senators and Congressmen, Governors and Mayors, Provincial and Municipal Councilors, etc., then the rules that put these people in position should be credible. I am a minarchist, not anarchist. I believe there is a rule for government -- to have rule of law in society, especially the laws protecting the people's right to life, right to private property, and right to liberty and expression. Beyond that, I think most other government functions are secondary or unnecessary. Promulgating the law on honest election is an important function of government like the Comelec. 1. No one has the monopoly of good intentions. Argue if we must, however passionate we may be. But let's also seek to understand in the same way we want to be understood. 2. To reiterate, I really hope more people consider serving in government as it is there where they can walk their talk. I commented on his second posting and said that people should ask government to stop intervening and regulating too much in the private sector, so people there can create more jobs. Job creation and selling various things and services is not a crime that requires lots of government permits. 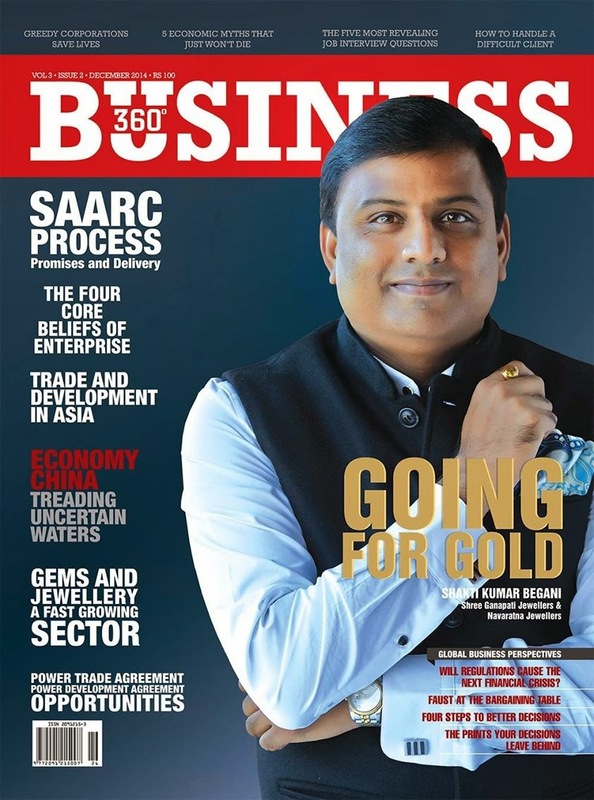 * This is my article for the business magazine published monthly in Kathmandu, Nepal. Asia is home not only to the most populous nations around the world like China, India and Indonesia, but also to the fast-growing economies, big and small. Opening up to global trade is among the most useful policies that governments of these more fortunate economies have undertaken. Below is a short summary of the human resources – producers and consumers, sellers and buyers, entrepreneurs and workers – of selected Asian economies. For brevity purpose, only the big population (above 20 million) economies are included in this table. Gross domestic product (GDP) is expressed in Purchasing power parity (PPP) valuation to levelise the pricing and valuation of similar goods and services across countries. b. Merchandise exports, ADB, Key Indicators of Asia and the Pacific 2014. The columns on Multiple are not part of the tables from these sources; they were only added in this paper. While most of the praise in the world is directed to East Asian economies, those in South Asia, in particular India and Bangladesh, are also showing renewed dynamism. There is a need to keep that momentum and for others, to pick up speed and momentum. Opening up to more global trade, reducing restrictions and regulations in exports and imports, is among the most important policy reforms that a country can take. And it is not only more exports but more imports as well. When local producers have more access to better machines and newer technologies from abroad at more competitive or affordable prices, that alone quickly improves their productivity. And it translates to business expansion and more job creation. 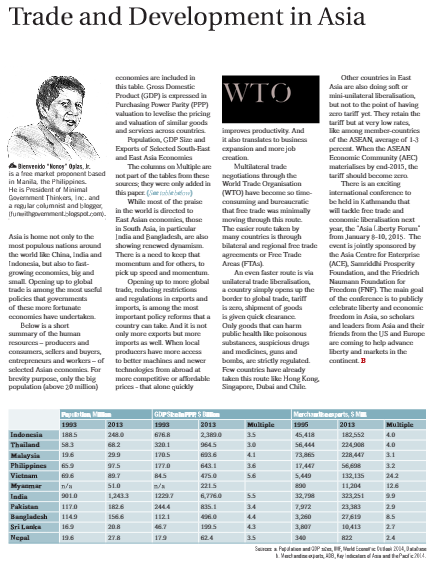 Multilateral trade negotiations through the World Trade Organization (WTO) have become too time-consuming and bureaucratic that free trade was minimally moving through this route. The easier route taken by many countries is through bilateral and regional free trade agreements or free trade areas (FTAs). An even faster route is via unilateral trade liberalization, a country simply opens up the border to global trade, tariff is zero, shipment of goods is given quick clearance. Only goods that can harm public health like poisonous substances, suspicious drugs and medicines, guns and bombs, are strictly regulated. Few countries have already taken this route, like Hong Kong, Singapore, Dubai and Chile. Other countries in East Asia are also doing soft or mini-unilateral liberalization, but not to the point of having zero tariff yet. They retain the tariff but at very low rates, like among member-countries of the ASEAN, average of 1-3 percent. When the ASEAN Economic Community (AEC) materializes by end-2015, the tariff should become zero. There is an exciting international conference to be held in Kathmandu that will tackle free trade and economic liberalization next year, the “Asia Liberty Forum” on January 8-10, 2015. The event is jointly sponsored by the Asia Centre for Enterprise (ACE), Samriddhi Prosperity Foundation, and the Friedrich Naumann Foundation for Freedom (FNF). The main goal of the conference is to publicly celebrate liberty and economic freedom in Asia, so scholars and leaders from Asia and their friends from the US and Europe are coming and help advancing liberty and markets in the continent. On my part, my family took a bus/roll on roll off (RORO) trip to several islands of the country and the two girls enjoyed two great beaches so far. 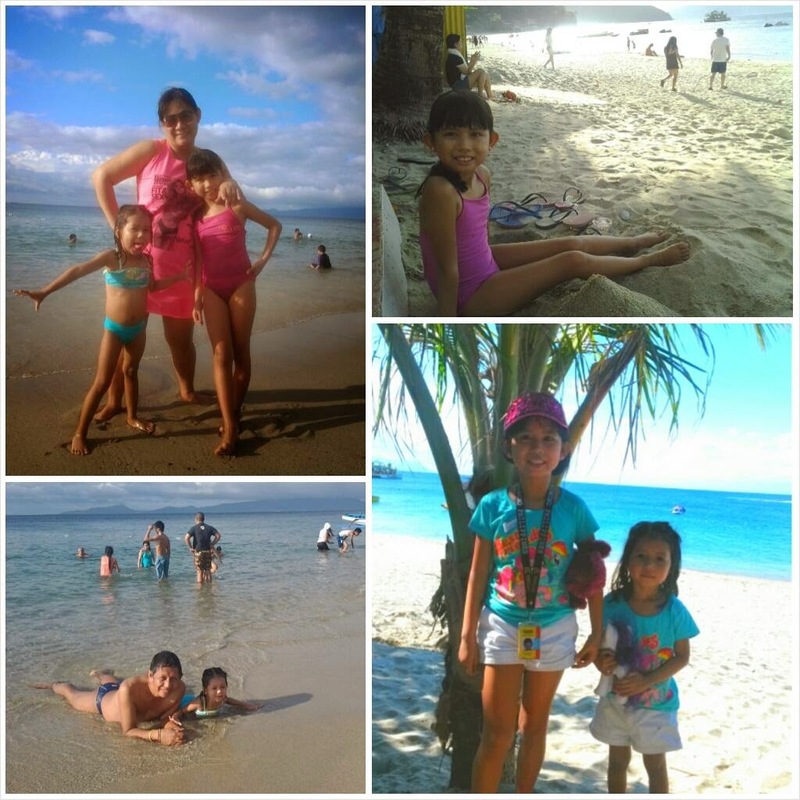 Last Sunday, we went to White Beach, Puerto Galera, Oriental Mindoro province. This used to be a very famous destination for those who want white sand beach. But I think people now have more choices to visit, thanks to budget airlines, more comfortable vehicles and buses. In short, P.Galera does not appear to be so attractive to many people now in Metro Manila and surrounding areas. Nonetheless, the two girls enjoyed the place. Then we went to Roxas, the southern municipality of Oriental Mindoro (P. Galera is on the north) to take the boat to Caticlan, Aklan province, so we can go to Boracay. 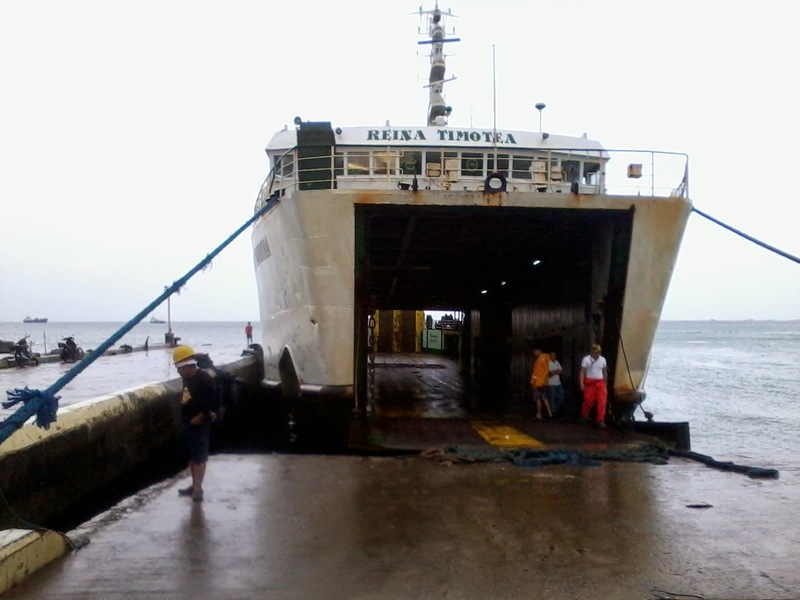 We took this boat from Roxas to Caticlan, about 4 1/2 hours. We boarded the boat around 11:30 pm, it finally left Roxas port around 2:05am. 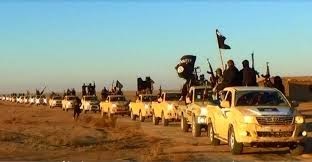 It was full of passengers, buses, trucks and cars. Safe trip. It was also the first big boat ride of our two girls. We checked in early at La Carmela hotel in Boracay, it's good there was a vacant room as there were many people in the island-beach. 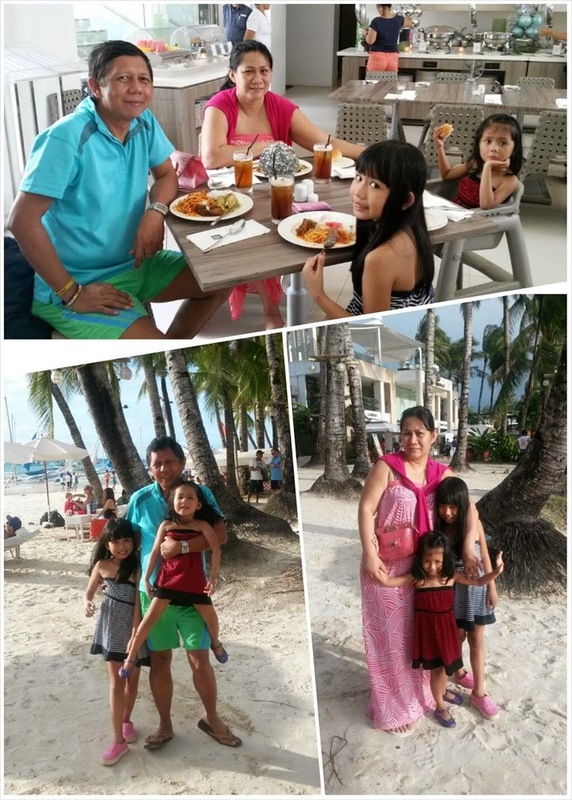 Lunch at Astoria Boracay. They have a promo, they were selling a club membership package, they gave free buffet lunch before the seminar. Nice food, nice hotel. Only one night and we travelled to Iloilo, to my wife's family. It was a tiring but good trip. Dec. 21, we slept at Puerto Galera, Oriental Mindoro. Dec. 22, we slept at a boat, moving from Mindoro to Panay islands. Dec. 24, we were in Iloilo City, Iloilo province. 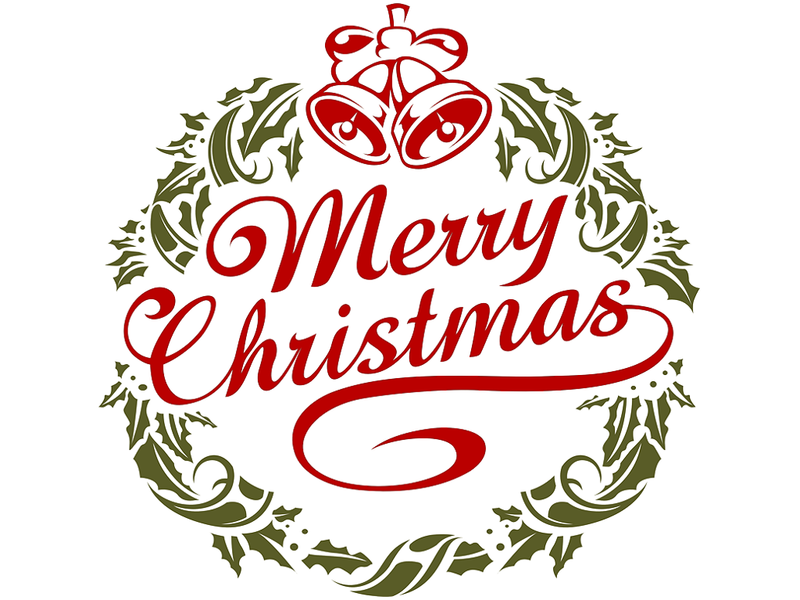 Once again, Merry Christmas friends. Much about the practice of bribery remains murky. The OECD’s first report on the subject, published on December 2nd, sheds some light. Some findings confirm what was known or suspected. But the report also undermines some common beliefs. 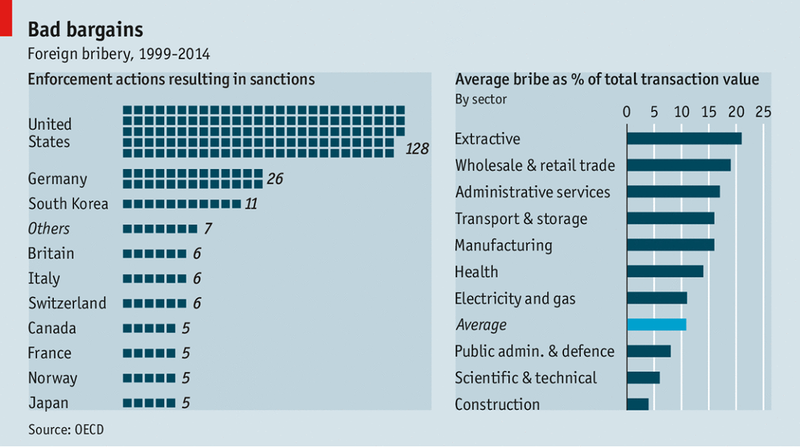 Bribery is not a sin of rogue employees or poor countries. 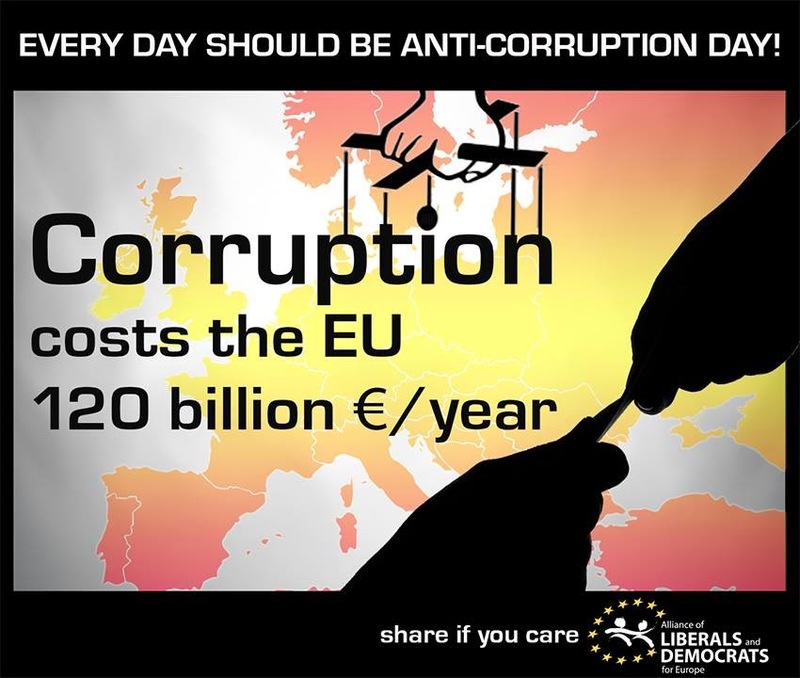 Yes, as governments expand, the opportunities for corruption and bribery also expands. The more restrictive, the more bureaucratic the government processes, the more corruption and bribery that will take place. Why? Because most of those bureaucratic procedures were deliberate, to make simple things become complicated, more time consuming and more costly. So players have only two choices --- endure the long, bureaucratic and costly process, or hasten it via bribery and corruption. The implication here, corrupt leaders need not be thieves and steal public money. They can still become super-super rich in government by declaring many restrictions and prohibitions: No gambling, no prostitution, no drugs, no smuggling, no gun running, and so on. Then allow all of these, in exchange for huge bribes. So more prohibitions and regulations mean more opportunities and temptations for corruption and bribery. A friend from FNF, Olaf Kellerhoff, posted this once in his fb wall. Even rich countries characterized by strong adherence to the rule of law can have a big portion of "rule of men". Corrupt officials and personnel who think they can get away with any prosecution. Less or minimal governance is good governance. Philippine politics is already "postmodern"??? Tonton cited this as an example, "our Constitution being openly challenged and undermined, without even mounting a coup. We have a Visiting Forces Agreement that subordinates our sovereignty to another country." Last time I checked, foreign investors still cannot invest in areas that are either totally prohibited (ie, reserved 100 percent to Filipino investors only) or restricted (they can invest, 40 percent max equity), because the Constitution is still being upheld. I have read the VFA, a short document actually, maybe only 3-4 pages long. There is zero, nothing there, that says American military personnel can steal or land grab or kill here if they like and they will not be subject to PH laws. What PH sovereignty was subordinated? So because the PH Executive and Legislative bodies try to "undermine" the Supreme Court and institutions, it is defined as "postmodern"? Since I am not a political scientist by training and it is a technical term in that discipline, I asked other friends who are political scientists. Tonton's colleague at DLSU, Louie Montemar, defined the term as "post-modernism, there is no universal “truth”, truth is negotiated and can only be 'possible' in 'small' groups." no single “truth” can be established about anything, including good and evil, and that ideas should be deconstructed to find meaning.... If there is no single “truth” that is acknowledged by all people, then those people are more likely to question the actions of their government. I like wisegeek's definition. Governments thrive on coercion, they are forcing, coercing, arm-twisting their citizens to follow certain rules and legislations (from high and multiple taxes and fees, no business should start unless they get dozens of permits, no smoking there, no parking here, no pedestrian crossing there,,...) they enacted, with fines, penalties and imprisonment for violations. Because those rules are the universal "truth" that must be obeyed. Post modernism politics in effect negates that universal "truth" imposition by governments, or at least many of those "truths" that became local and national legislations. 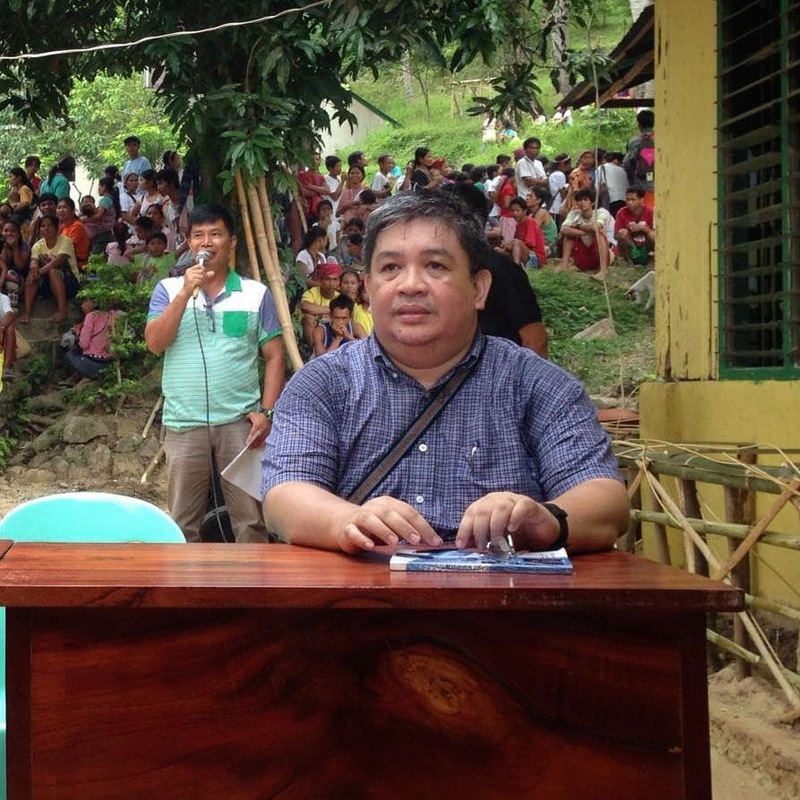 "In short, everything is negotiable in Philippine politics. We deconstruct and destabilize well-established political concepts, constructs and processes. In political theory, these are telltale signs of the post-modern." I think the author just wanted sensationalism in his article. Being an academic, he uses academic terms like "post modern" to sound sophisticated and advance a lousy analysis. We have not even reached a "modern" state yet where the rule of law really rules, and not the rule of men. That is how some academics fool their readers. Using jargons and sophisticated-sounding terms to sell a lousy analysis. I like Louie's definition too, "truth is negotiated and can only be 'possible' in 'small' groups." Tonton was talking about a big group, the entire country, not just a small group like a rotary club, a running club or a university student council or a company union. So his conclusion, "everything is negotiable in Philippine politics" is, ummm, post-modern garbage, hehehe. 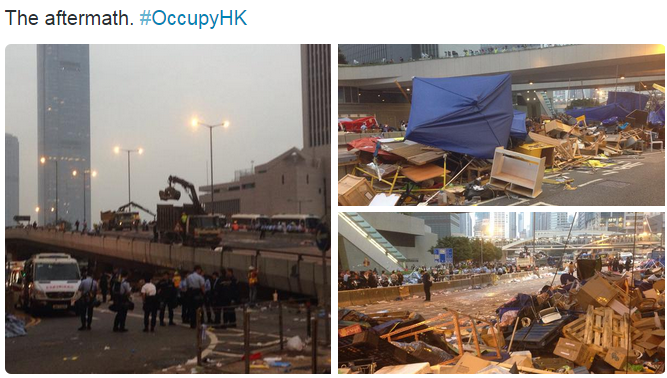 This afternoon, the Admiralty in Hong Kong has been cleared of protesters and their tents, other obstructions. 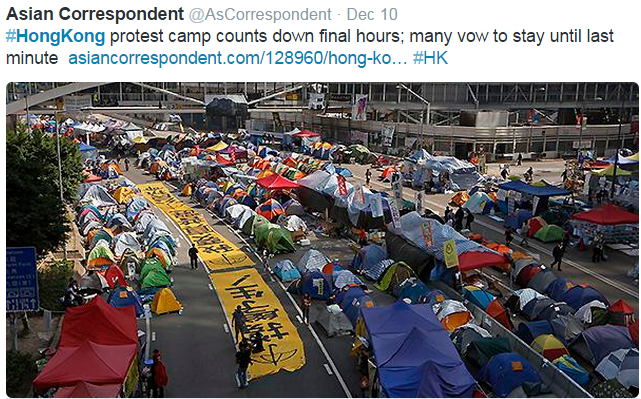 I support the cause of the protesters -- greater political independence from China communist government. I support the street occupations, but only for a short period of time. This morning, twitter photo from the Asian Correspondent. Freedom of expression is good and noble, I support it, but it should not restrict or contradict freedom of mobility of other people. Street occupation for a few days or weeks is understandable. But for more than two months, I think it is wrong. 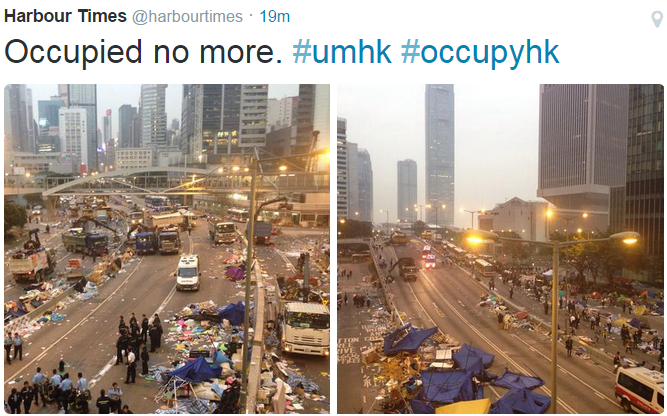 Below, twitter pics from the Harbour Times. I and some friends visited that site at the Admiralty last November 5, 2014. My immediate impression was that the protests have morphed to become a "tent movement" from the original "umbrella movement." So many tents with no one inside, except for a few tents at the protest center. Four lanes each, total of eight lanes, were occupied by many tents and protestors at the Admiralty/ Many go home afterwards. People cannot live in tents for days or weeks -- no toilets, no showers. Portable toilets are good only for half-day or whole day rallies, but not for weeks and months. There was "mass arrest" too. 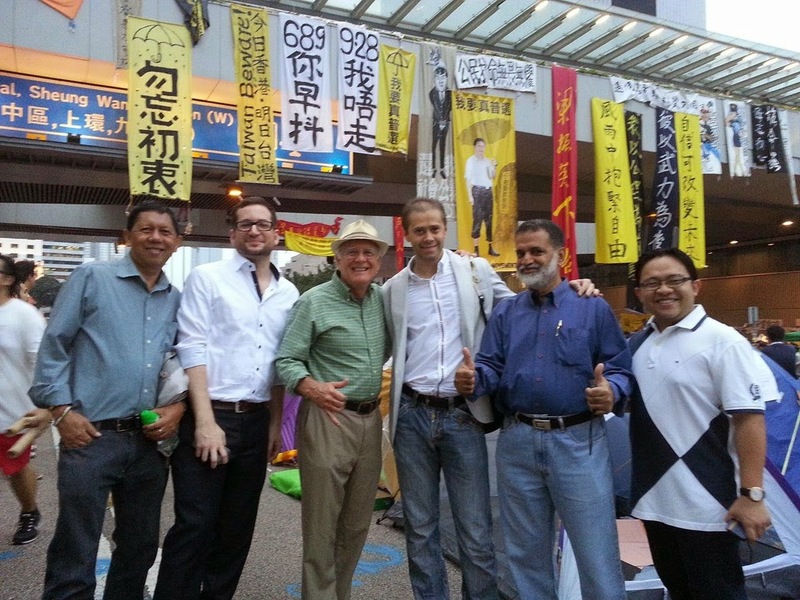 .I don't know the details why such action was done by the HK government. I think removing the tents and other obstructions should be enough. Poor Jimmy Lai. I heard him speak during the EFN Asia conference 2004 in Hong Kong. Very articulate, down to earth, and liberty-minded guy. Too bad that he is among those arrested. I heard Emily Lau during the EFN Asia conference 2014 in Hong Kong, just last month. She too is a very articulate and passionate speaker. Again, I support the cause of the protesters -- NO to more China communist government heavy hands in Hong Kong. But while the protesters have this freedom of expression, other people in HK, both locals and foreign visitors, also have the freedom of mobility to pass that busy road at the Admiralty, also in other occupied areas. The latter should not be sacrificed for many weeks and months at the altar of the former. 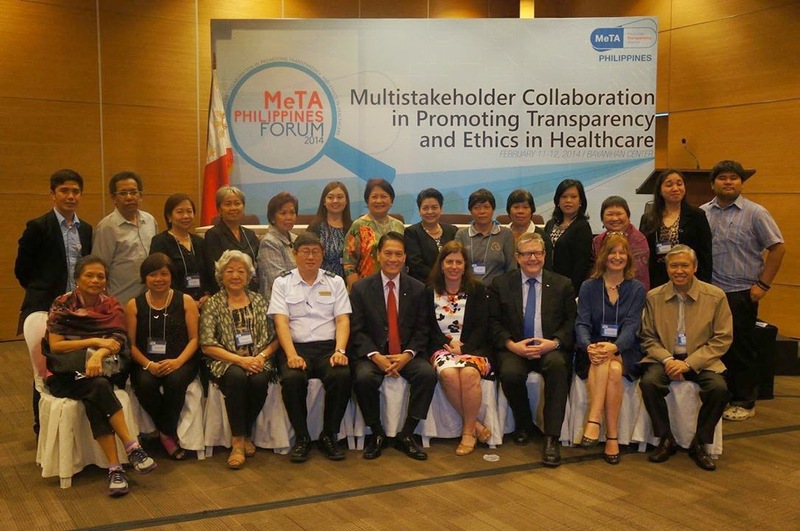 The Medicines Transparency Alliance (MeTA) Philippines will be conducting meetings and fora next year related to health transparency and its own financial sustainability. It is a UK Department for International Development (DFID) funded project conducted in seven developing countries including the Philippines. Thus, while MeTA is classified as a non-government organization (NGO), technically it is a government-funded organization (GFO). Despite this fact, MeTA-PH is providing the regular venue for multistakeholder discussions on medicines and healthcare in general in the Philippines. 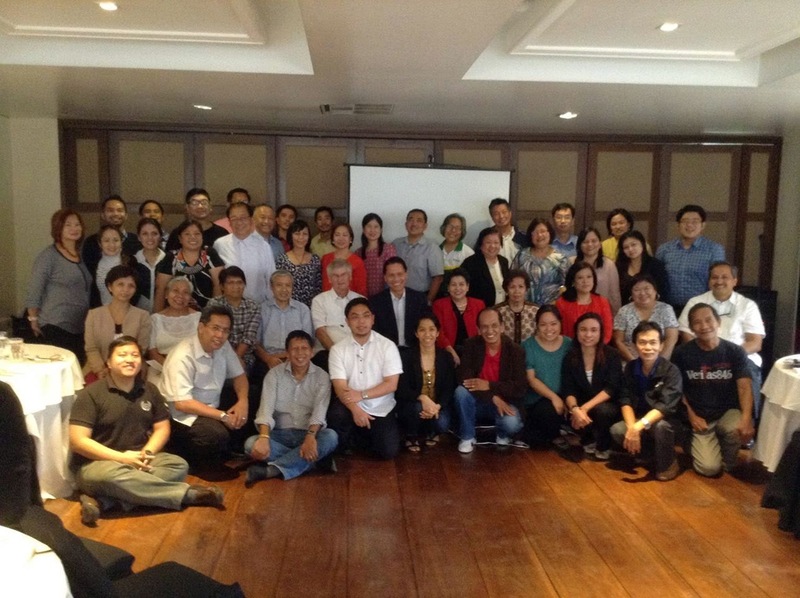 Below, in one of the big meetings of MeTA held in Makati, early July 2014. The Department of Health (DOH) Advisory Council for the implementation of RA 9502 (Cheaper Medicines Act of 2008) seems to be dead, at least temporarily. Zero meeting this year. There should have been about two meetings, like the one in mid-July 2014, but in both cases, they were cancelled. And no reason/s is/are given why the meetings are cancelled. I suspected that the July meeting was cancelled because the DOH got busy with the Disbursement Acceleration Program (DAP) controversy where the DOH got P3+ billion of extra funding from that program. When DOH Under Secretary Mads Valera was still there, the agreement was a quarterly meeting. When she left the DOH, the meetings were also gone. I think there is also zero meeting by the Congressional Oversight Committee on RA 9502 this year, the legislators (House and Senate) perhaps just divided among themselves the P10 M/year average budget of Congressional Oversight Committees. Another fiesta time for Congress. So if DOH cannot provide the regular consultation and dialogue process, MeTA should fill that vacuum. And Yes, MeTA should go for a real civil society and NGO status, not largely GFO. The annual dues for all members, corporate, institutional and professional affiliates, individuals, should proceed and not sidelined. Government/multilateral money (UK-DFID, WHO, etc.) can help finance the overhead expenses but the regular fora and conferences should be internally generated. Many local pharma companies, innovator and generics, can co-sponsor certain events. Participants can also pay minimal registration fees, and so on. Below, another MeTA meeting held in February 2014. Both photos I got from MeTA facebook page. Past President of the Philippine Pharmaceutical Association (PPhA) Leonie Ocampo noted that medicines are not given due attention in protecting their integrity in the supply chain Rather, quality (transport, storage, dispensation, etc.) is sometimes sacrifice because medicines are used as a political tool. Thus, the need for a multistakeholder involvement to prevent their wastes, advance rational and responsible use of drugs. And the need for better system in the procurement, warehousing, distribution, and use of medicines. Tonight over dinner, I talked to a friend whose wife is a cancer survivor. He shared that his wife's doctor told him that until about 10 years ago, the survival rate of his wife's cancer at stage 4 was only about four percent (ie, around 96 percent mortality). 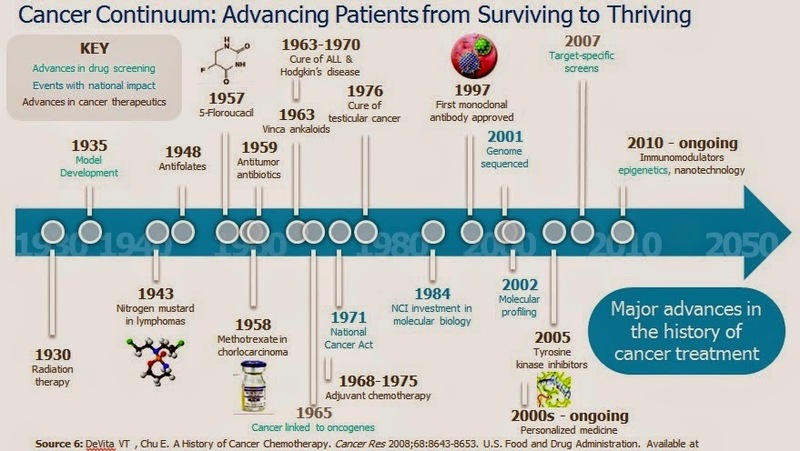 Now with new treatments, survival is more than 50 percent. Wow, in just 10 years! But her anti-cancer medicnes are expensive, something like P70,000 every three weeks for about one year. Good that they are both rich, they can afford it and recoup that money once the wife goes back to full time work. I think that in 10 years time, that P70k (DOF/BIR gets at least P8K of it in VAT alone) can go down significantly. This chart is true. A stronger and more financially sustainable MeTA-PH is a good springboard for dynamic multi-sectoral discussions and dialogue for more stakeholders participation, if not consensus building. I am not hopeful of the Advisory Council now to continue big multi-stakeholder participation given the recent and on-going politics at the DOH. In our book, “minimal government = maximum civil society”. That is why civil society organizations (CSOs) should be as independent of government as much as possible. Civil society is about volunteerism while government is about coercion. One can say that government is the “uncivil society” :-) Note that in government, things are done by coercion, with fines, penalties and even imprisonment for violations, Thus, the drug price control policy, the mandatory and forced discounts for all senior citizens including the rich and super-rich ones, are bad policies but they remain in force until now. And even if people are not happy with the 32 percent (max rate) mandatory withholding tax for fixed income earners, they are forced and coerced to send 1/3 of their monthly or annual income to the government. Dynamic and independent CSOs can point out certain mistakes of more government interventions and unnecessary regulations. One reason why the ecological movement is persistent on "man-made warming/CC" is because they are targeting amount of money, hundreds of billions of dollars per year, not per decade or one time payment. See various reports below. Hey taxpayers of rich countries, will you remain rich if this large-scale extortion is implemented via the UN and other multilateral bodies (WB, ADB, IMF, etc.)? Developing countries may need up to $500 billion per year by 2050 to adapt to the ravages of climate change, dwarfing previous estimates, a UN report said Friday. The figure was about 20 times today's public spending on climate adaptation, according to the United Nations Environmental Program (UNEP) that warned of a "significant funding gap after 2020." In 2012-13, the amount of global public finance committed to adaptation was about $23-26 billion, of which 90 percent went to developing countries. (IPCC) has projected adaptation costs in developing countries to reach $70-100 billion per year by 2050, based largely on World Bank figures from 2010. And on some calculations, based on national-level rather than global-level studies, "adaptation costs could climb as high as $150 billion by 2025/2030 and $250-500 billion per year by 2050" -- and double that if the global average temperature rise is allowed to approach 4 C.
Ooppss, the climate and environmental socialism movement is not happy with $500 B a year extortion. Some guys there want higher, like $90 trillion over 15 years or $6 T a year. 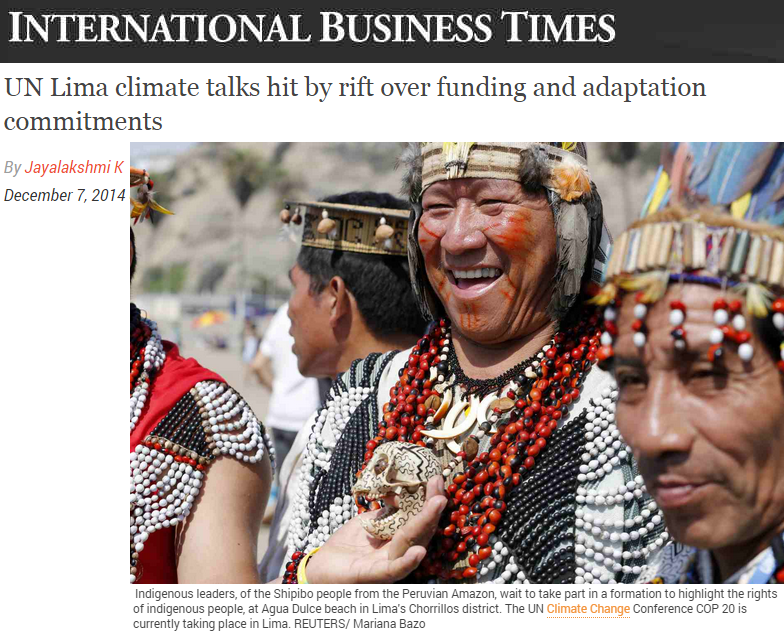 it was again proposed in Lima that richer nations should pay poor countries $100 billion a year to protect them from runaway global warming, the UN’s chief spokesman, Christiana Figueres, dismissed this as “a very, very small sum”. What is needed to decarbonise the global economy, she said, is “$90 trillion over the next 15 years”. It makes the £1.3 trillion we Brits are committed by the Climate Change Act to pay to halt global warming within 36 years look like chicken feed. Su was critical of the progress industrialized nations have made to boost climate-related aid to $100 billion a year by 2020. The Green Climate Fund, a UN institution meant to channel an unspecified portion of that aid to developing nations, has pledges for about $9.7 billion so far." Developed nations have so far pledged almost $10bn (£6.4bn) of public funds – including £720m from the UK – to a new UN “Green Climate Fund” (GCF) to help developing nations. China, which aligns itself with many of the poorest countries, has complained the total so far falls far short of a 2009 pledge by developed nations to mobilise $100bn-a-year of “climate finance” by 2020. “$10 billion is just one 10th of that objective,” Su Wei, China’s lead negotiator said, Bloomberg reported. But Elina Bardram, head of the EU’s delegation dismissed the claim, insisting the $100bn was always intended to be mixture of public and private finance. 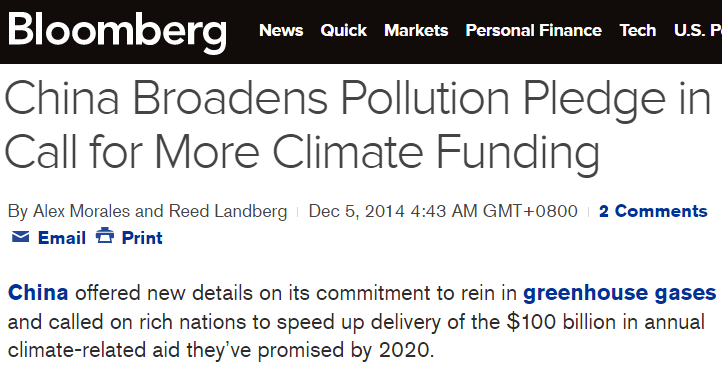 The GCF was “by no means the only vehicle for delivering the $100bn,” she told reporters on Friday. Achim Steiner, executive director of the United Nations Environment Programme (UNEP) said that adaptation costs could climb as high as £96bn ($150bn) a year by 2025 to 2030, and £160-320 bn ($250-500 bn) per year by 2050, compared with earlier estimates of £44-64bn ($70-100bn) yearly by 2050, reports Reuters. Responding to the UNFCCC report that between $340 and $650bn in finance for climate action is flowing globally with $40-175bn going to developing countries each year, Oxfam has noted that only a small proportion of climate finance is flowing from developed countries to developing countries. 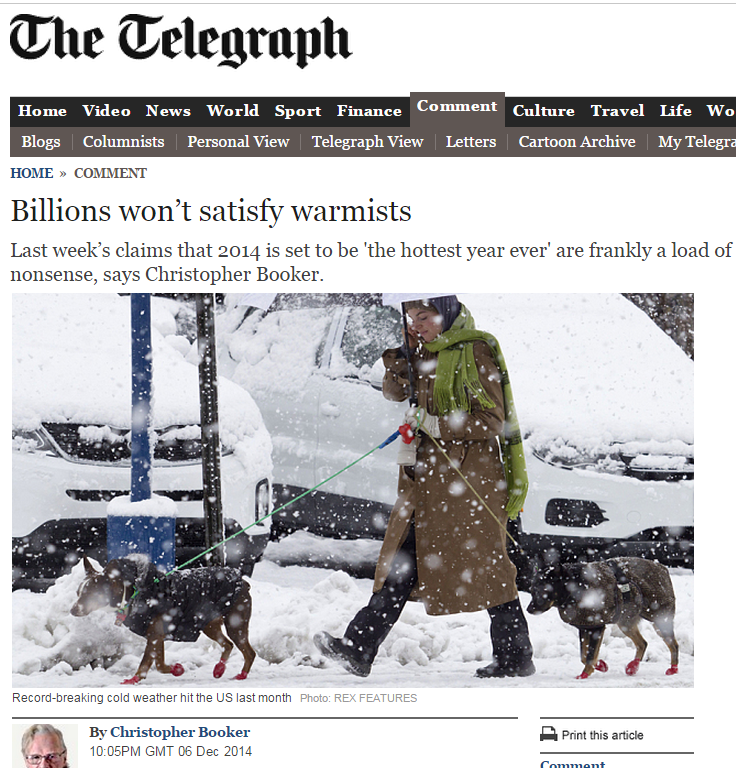 Hmmmm, the higher the extortion money being demanded from rich countries, the bigger will the climate lies ahead. 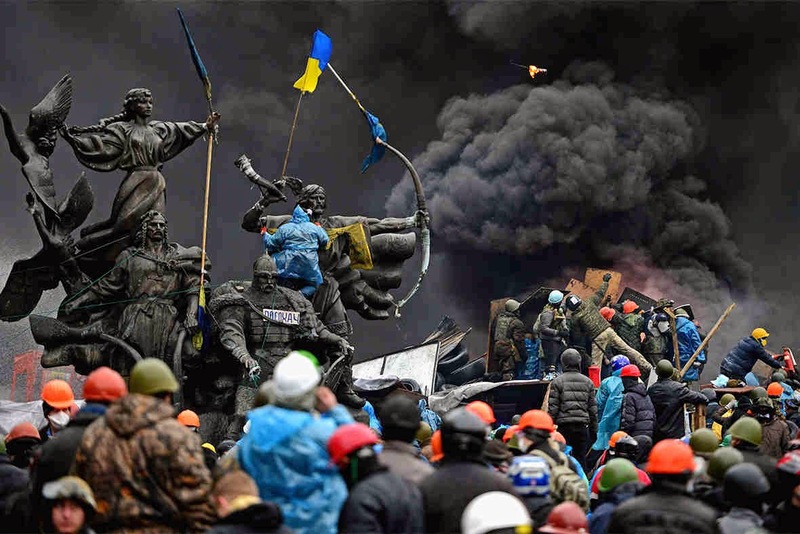 From WUWT, Onward marches the Great Pause, by Christopher Moncton of Benchley, December 3, 2014.